Hey everybody, it's me. The Dome. Did you miss me? I've been having a lot of self-image problems lately. Like I keep thinking I'd look cooler if I were geodesic. More Buckminstery, you know. Why can't I have Pauly Shore under me? Anyway, this week I subjected Big Jim to A Christmas Carol, with magnets. It was cool. 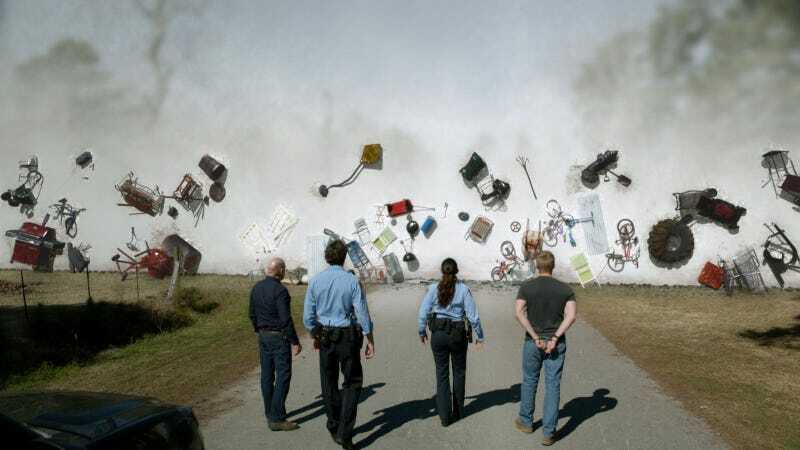 So in case you missed it last season, I'm going to be recapping my own show, Under The Dome. And basically, I'm going to be giving my Dome's-eye view of all the proceedings. Since I'm this show's main character and I'm the main actor in all the episodes — most of the events in this show happen because I make them happen, directly or indirectly. And the rest of the time, people stand around debating what exactly I want. So I figured I'd use this space to just talk it out. The most important thing to realize is that there's a program here, and you have to get with it. Or else. Like, at the end of last season, I crowned a Monarch. That was really important. I did that by using a butterfly, because double-entendres are awesome. I caused a butterfly-eclipse and blacked out the whole town, and then I whited the town out. And I gave people lots of visions of murdering Big Jim Rennie. So this time around, because Big Jim keeps insisting on killing Barbie — who is one of my favorites — I turn all magnetic and start sending out pulses that cause people to pass out. Many people are nearly killed, and in fact Linda the awesome deputy actually is killed, as a result of my magnetantrum. But I don't care, because this is all about teaching Big Jim Rennie that KILLING IS WRONG. This becomes clear after I send the two dead women of color, Dodie and Linda, to tell Big Jim off, and talk to him about Sacrifice. And meanwhile, I've been telling my four chosen kids to kill Big Jim. I pretty much make everybody in the town pass out except for Big Jim and my two most favorites, Barbie and the Monarch herself, Linda. And I send a pretty clear message: Big Jim's gotta die. But actually, he just has to be willing to die. So that the Monarch can show mercy on him, and he can realize that killing is bad. Because all of this has been about saving Big Jim's soul. Or possibly, keeping order inside Chester's Mill. Sure, that's it — I turned magnetic and ripped half the town apart, while causing massive injuries and at least one death, to keep the people orderly. Nah, I think it was to save Big Jim's soul. I just get so pissed off when I see the people acting like assclowns under me. When they run around killing each other and wrongly accusing each other of the murders they committed, and not washing their hands after they use the bathroom, I just get SO MAD. It makes me just lose control and go all magnetic and start sending out the pulses with ever-increasing frequency. WHOOMP WHOOMP WHOMPWHOMPWHOMP. If you try to hang someone for the murder you yourself committed, you don't get the butterflygasm. No you do not. You get the magnetantrum. That's just how it goes under me. As the newly introduced science teacher, Rebecca, helpfully explains, the magnetic pulses are coming closer together, like a pregnant woman's contractions. Except that this particular childbirth is going to give birth... to death. She explains this with a straight face, because she's a scientist. I'm so glad there's a scientist under me, because now we can have endless, unrelenting debates over Science Vs. Faith. That's what keeps my surface all shiny, is knowing there are people debating science and spirituality under me. Especially when Rebecca insists her jury-rigged electro-magnet was what stopped my magnetic pulse 'o' death, and Julia and Barbie exchange glances because they know what really happened — I was offered a sacrifice, and was therefore pacified. Which explanation would YOU believe? So yeah, people had to die. But Big Jim learned something, maybe. He seemed a bit more mellow. He started saying things that rhymed, like "sunrise, fresh eyes." That's worth Linda's life, right? Of course it is. The point is, everything I do, I do for a reason. Sometimes the reason is that I wish I was over a cooler New England town, like Montpelier VT. Did you know Montpelier has the highest percentage of PhDs per capita of any town? And like five independent bookstores. Can you imagine if Big Jim had a PhD in, I don't know, socioeconomics? What do you mean, that's not a real subject that they give PhDs in? When I start the University of the Dome, it will be. And we'll have classrooms where everybody hallucinates butterflies and dead women of color. Oh, anyway, it's not just Big Jim I'm interested in. I'm also interested in his son. While he's passed out, I gave James a vision of his mom, who's still alive in a town called Zenith that sells really big snowglobes of itself that randomly turn to bloodglobes sometimes. And his mom is still making weird paintings, including a cool one with a doorway in a blue wall with a red swoosh over it. Looks sort of like a mid-80s Dire Straits album cover. That Dire Straits cover painting has a dire warning for the people of Chester's Mill, I'll tell you that much. Then it turns out that Sam is actually James' Uncle Sam (and presumably, Big Jim's brother? Or brother in law?) And his reappearance Means Something. And finally, the mysterious not-drowned teen girl wanders into the school, directly under my dead center. Since she said "sorry" on my behalf, I'm just going to guess she's like my avatar, or my deputy Monarch. (My Princess?) Anyway, Angie follows her and tries to talk to her, and gets a faceful of cleaver for her trouble. So what did we learn this week? First of all, that I hate killing. Most of the time. And when I send a vision of Big Jim being killed, along with a lot of indications that this is what I want to happen, I actually mean, "Don't kill Big Jim." Also, I'm getting some bird poop along my exterior, and the longer that goes on, the crankier I'm going to get. I've tried sending some butterflies to scare off the birds, but I don't really control any external butterflies plus the birds would just eat them. So maybe if someone figures out a way to get a message to the outside world to send people with ladders and squeegees, I won't kill anyone else for a week or two. No promises, though.